I want to be a friend of yours, especially if you want to be a friend of mine. Dear Mr. Mendelson, sorry for not answering your question earlier I did not know that Facebook filters messages and I was not able to see it. I assume you are going to say that the Jewish community was the one that stood with Blacks during the Civil Rights movement? Forgive me if I am wrong but this I assume because of your name, your location being in New York and your liking of the Bill Maher page that is prominently displayed on your Facebook wall, but let me give you a bit of alternative but true history. The truth is the Jews did not stand with Blacks during the Civil Rights era because they had an interest in protecting the rights of Blacks, the Jews fought for Civil Rights because they had an interest in protecting themselves, in fact the Civil Rights Movement is a Jewish movement, it is a movement that co-opted Black political support and used the Black community’s political strength for its own aims, just as the Democratic party does today. Prior to the Civil Rights era Black people were fighting for Black Rights not Civil Rights, you can refer to writings of Marcus Garvey or Malcolm X and see that “BLACK POWER” was the rallying cry before the era of Civil Rights and integration. Prior to World War 2 the Nazis had exported their ideology to other parts of the world such as Argentina, Rhodesia, apartheid South Africa, Namibia and the United States. In fact Nazi youth camps were setup across America and the Jews knew this, so, the fall of the Nazis in Germany was not the only threat the Jewish community faced, it also faced ideological anti-Semitism globally, America not excluded. The Jews knew that they needed a set of laws that would protect them from White nationalism, this they had to learn the hard way throughout history in particularly the Middle Ages, Jews were blamed for everything from famine to diseases, the Jews were always the scapegoat. IN FACT on page 440 of Adolf Hitler’s book Mein Kampf he referred to the Jewish agitation for CIVIL RIGHTS way before the Nazis took power in Germany. “First he uses the bourgeoisie as the battle ram against the feudal world, then the worker against the bourgeois world. Just as at one time he knew how to gain by sneaking the CIVIL RIGHTS for himself in the shadow of the bourgeoisie, thus he hopes now that in the worker’s fight for his existence, he will find the way towards a leadership of his own.” This Adolf Hitler wrote in reference to Karl Marx, a Jew, who wrote the communist manifesto during a time when German workers were agitating for greater political representation. So we see that Jewish people were advocates of Civil Rights as a means of protecting the Jewish community way before the Nazi’s even took power in Germany, they just brought that movement over to the United States with them. 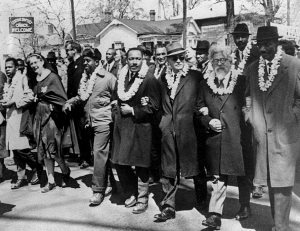 The Jewish co-option of the Black rights movement into the Civil Rights movement did not end with the NAACP, Jewish individuals financed and even helped to write some of Martin Luther King’s speeches. Throughout European history whenever there was a great tragedy or White nationalism was on the rise Jews were the first to be blamed or persecuted by them and the Jewish people have come to understand this. So we see that the Jewish participation in the Civil Rights movement had nothing to do with their desire to see certain rights allotted to Black citizens, it had everything to do with protecting their own interest and their position in society, and there is absolutely nothing wrong with that.